In addition to two new Royal Enfield bikes sitting out front during the show, which opened at 10 a.m. on Saturday, the intersection of Main and Madison Streets were perpetually lined with motorcycles throughout the day as fans, friends and passersby out for a nice cruise stopped in to take a peek at some the new, vintage and custom built bikes that Joel has in his collection. 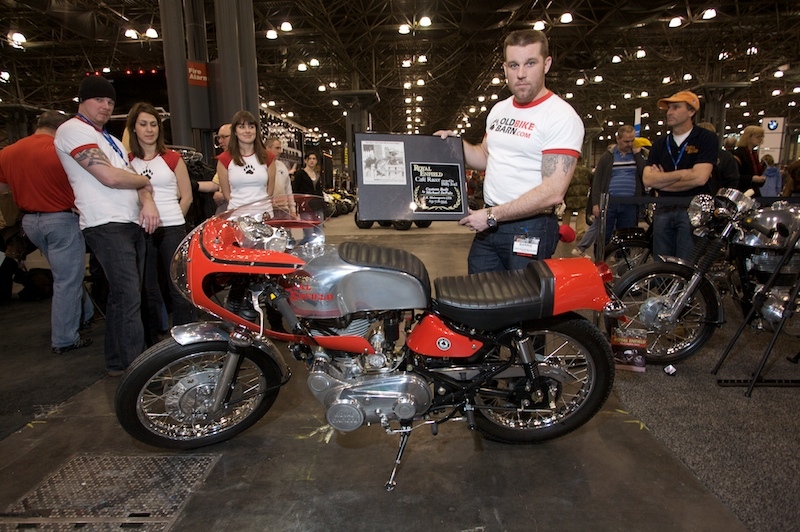 While Joel had some actual vintage bikes on display, some of the bikes were a combination of ground up builds designed to replicate the look of vintage bikes, as well as stock bikes that were accessorized with older parts. "There are a few ways you can get bikes like these. You can build them from scratch, you can modify an existing stock bike, which we did with my Harley Davidson Sportster and with the Springer Classic, or you can just take a new bike and accessorize it with old parts which is the simplest, fastest and probably cheapest way to do it. It depends on your budget and how far into it you want to go," said Joel on the second day of the exhibition. 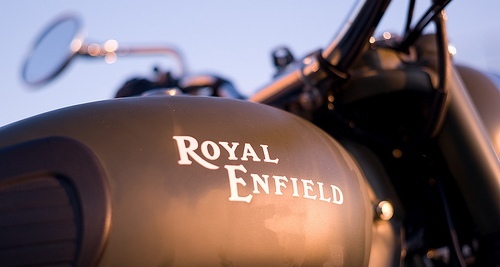 "This military style Royal Enfield represents the quickest, cheapest way to do it. The bike actually comes stock looking like this: same color, same set-up. The only thing I did was swap out the seats, put an English style license plate on the front fender, swapped out the tank emblems, put an RAF military emblem on it, added an old military knife, General Montgomery's beret," he laughed. "Just a couple of custom touches that add to the vintage appearance of the bike, but the ground up builds are real works of art, everything on the bike is fabricated by hand." 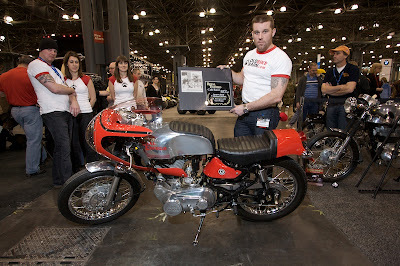 Other than Harley Davidsons, the bikes made by Royal Enfield, a British motorcycle manufacturer now owned by a company based in India, were among the best represented in Joel's collection, mostly in the Café Racers section of the show. "This Café bike is a Royal Enfield as well, if you take a look, it's a stock Royal Enfield Bullet," said Joel. The only thing I changed on this was again, put a British plate on the fender, put a tank rack on it and swapped out the seat, other than that it's a stock bike." As Joel explained, Café Racer bikes were the European equivalent to the 'choppers' popularized in American culture during the post war period. "What they would do in Europe with the Café Racers is they would set them up like a racing bike. They would put a fairing on it, swap out the tank for an elongated alloy tank, take the handlebars off and put on racing clip ons and move the foot pegs back so you'd be leaned way over the tank in a racing position," Joel explained. "That was the whole style of the Café Racers, which was the European version of the custom, bad guy bikes, whereas in America the guys who came back from the war would take Harleys and Indians and knock parts off them to make them hot rods and make them faster. In Europe they did the same thing except they didn't have Harleys and Indians, they had Triumphs and Motor Guzzis, BSAs, Nortons, Ducatis."